I’ve always been more of a text person than an images person when it comes to reading history, but The World Cruise of the Great White Fleet has persuaded me to change my mind. This handsome volume, subtitled “Honoring 100 Years of Global Partnerships and Security” commemorates the centennial of the voyage of Teddy Roosevelt’s U.S. Great White Fleet around the world. I was a bit chagrined to learn, despite my having read a book about U.S. sea power a couple of years ago, that the ostensible cause of the cruise was a war scare with Japan that died down almost immediately – that had totally escaped my memory. In fact, Roosevelt’s desire to announce America’s emergence as a world naval power was the real motivation. Interestingly, when Senator Eugene Hale of Maine threatened to withhold money from the cruise, “the undeterred Roosevelt replied in his typically brusque and forthright manner that he already had sufficient funding to get the fleet to the Pacific, and if the Congress wanted the fleet to return to the Atlantic it would have to authorize the additional funding.” TR didn’t mince words, now did he? Although the text concisely covers the ships, the mean, and the cruise of those dazzlingly white battleships and accompanying torpedo boat destroyers, the real pleasure is leafing through the illustrations. If you’re a ship fan, there are paintings and photos galore (left). I liked the photos of the crew at work, crossing the Equator, riding camels in Egypt, and just smiling into the camera all those years ago. 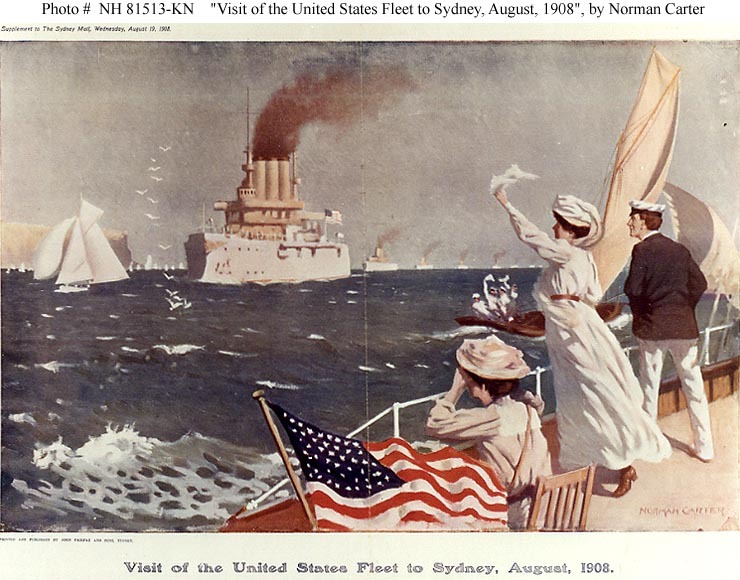 In the narrative section, there are lots more photos and great reproductions of souvenir postcards, magazine covers, and banners from Hawaii, New Zealand, Australia (left), Japan (where instead of war, the fleet was greeted by overflowing hospitality) and China. It’s an outstanding collection, beautifully presented. 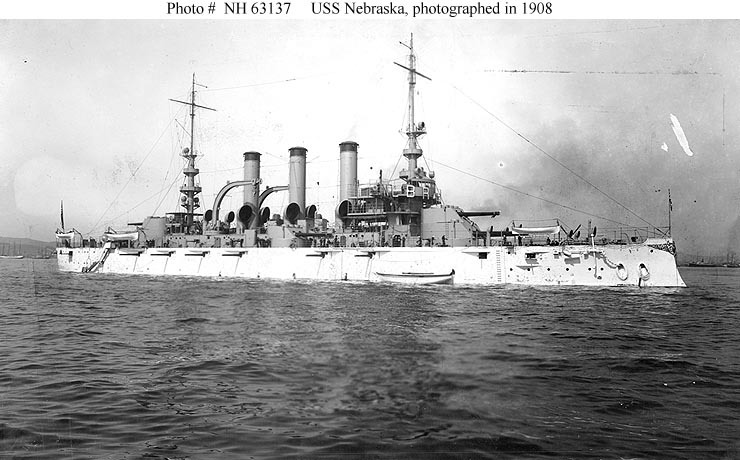 Produced by the U.S. Navy’s Naval History & Heritage Command (and please check out its redesigned Web site, which features many images of the cruise), The World Cruise of the Great White Fleet has much to offer Navy buffs and anyone interested in history as word and image. You can get your own copy here or find it in a library here. This entry was posted on Friday, October 15th, 2010 at 10:13 am and is filed under U.S. Navy. You can follow any responses to this entry through the RSS 2.0 feed. You can leave a response, or trackback from your own site. sure I will be told many new stuff proper here! Best of luck for the next! Government is to a society what the head is to the body. Very great in past, present and future contribute to the good by warning to the world oceanic water and wind activities how;what. “THE WORLD CRUISE OF THE GREAT WHITE FLEET” IS AN EXCELLENT WORK!IN MY OPINION , A HANTSOME VOLUME LIKE THIS , IS MUCH MORE THAN A SIMPLE BOOK!THIS IS A PART OF THE GLORY OF THE U.S.NAVY!NAVY OF COUNTIES WITH BIG TRADICION ON SEA , LIKE U.S.A. , GREAT BRITAIN , GREECE , AND OTHERS , NEEDS WORKS LIKE THIS!